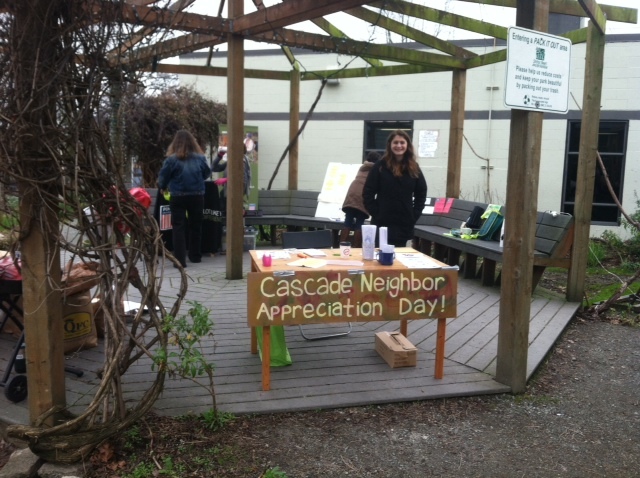 Neighbor Appreciation Day was a big success and tons of fun for the Cascade neighborhood! We handed out over 60 “passports”, which were used by community members to walk around, meet and become aquainted with local establishments. Twenty neighborhood establishments participated in the event. The participating locations were asked to “stamp” the passports of anyone who came in and introduced themselves. Participants also had the opportunity to ask trivia questions to each business. The central meeting point was at the Cascade People’s Center, which was bustling with activity! The Humane Society’s mobile adoption center, the MaxMobile, was present for the day – one dog was adopted! Inside was the 2nd annual NW Girls Coalition Resource Fair, which pulled in a lot of young women from the greater Seattle Area. Outside, hot dogs and snacks were provided by the Cascade Neighborhood Council, and PEMCO donated platters of cookies and pastries from Nollie’s Cafe. PEMCO, Lake Union Wellness and Umpqua Bank all had representatives at the Cascade People’s Center to answer questions and talk to neighbors about their businesses. Immanuel Lutheran Church and the new Williams Apartments (Plymouth Housing) provided tours to anyone who entered. Twelve participants were awarded prizes for their amazing efforts to get to know the neighborhood. Kim Johnson was the overall winner, with all businesses stamped and 10 trivia questions answered correctly. Examples of prizes include $25 gift cards to local restaurants (Paddy Coynes, Lunchbox Laboratory, Vivace), 2 tickets for the Seattle Great Wheel and an Umpqua Bank coffee gift bag. A special thank you goes to Vulcan, Paddy Coynes, Lunchbox Laboratory, Umpqua Bank and the CNC for providing prizes. All in all, it was a great event that we hope to host again in the future! Thank you to all who participated and for making this a great Saturday in the neighborhood!